By one o the ironies of military strategy, the Syrian government forces and their Russian allies concentrated on the current battle for Aleppo, leaving the historic city of Palmyra largely unguarded. 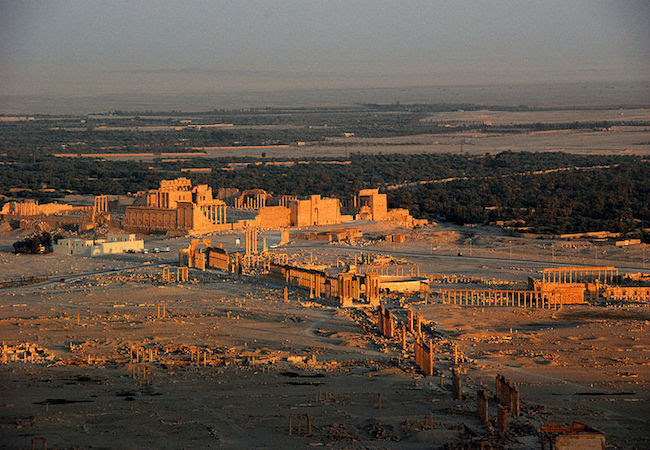 The Islamic State (ISIS or Daesh in Arabic) had held Palmyra, called “the Venice of the Sands” for some10 months, starting in May 2015 until they were forced to leave by Syrian government forces and allies in April 2016. In May 2016, Russia had celebrated the flight of ISIS with a short concert of Prokofiev’s music played by musicians from the Marinskiy Theatre in the Roman-era outdoor theater and a video talk by President Putine. Now ISIS forces are back in control and both the people and the monuments of Palmyra are in real danger. When in control of Palmyra, on 23 August 2015, the temples of Baalshamien – Lord of the Heavens – and Bel – a goddess often associated with the moon, had been largely destroyed by ISIS. This iconoclastic approach to pre-Islamic faiths and their material culture is the same which had led to the destruction of the large Buddha statues in Afghanistan – monuments that attested to the rich culture along the Silk Road. The destruction of the Palmyra temples was also to show the impotence of the international community to stop ISIS. Smaller artifacts were destroyed or sold off in what has become a massive trade of looted art works. ISIS had again taken control of Palmyra with a combination of “sleeper cells” – persons loyal to ISIS who stayed on waiting for orders to attack and from ISIS fighters who have been dislodged from other cities. There is a real danger that ISIS leaders will push for revenge killings of people and will destroy more art works with a “burned earth” mentality. It is difficult to know who or what can serve as moderating influences on ISIS to respect humanitarian law concerning people and respect for the common heritage of humanity concerning works of art. Syria and Iraq are home to some of the world’s first cities, a complex and unique meeting of states, empires and faiths. The protection of works of art and cultural heritage is an aspect of world law in which UNESCO is playing a leading role. There is also a need to build an awareness and then action on the part of non-governmental organizations, especially those in consultative status with the United Nations. One of the difficulties with appeals to the “international community” is that the international community has no street address and so appeals are rarely delivered. Too often, governments and people react after events rather than affirming positions from a deeper level of awareness and a legal basis in world law. Today, there is a need for a world-wide demand for the protection of the cultural heritage of Palmyra. The protection of cultural heritage owes much to the vision and energy of the Russian artist Nicholas Roerich (1874-1947). Roerich’s desire to make known the artistic achievements of the past through archeology, coupled with the need to preserve the landmarks of the past from destruction, led to his work for the Banner of Peace to preserve art and architecture in time of war. Roerich had seen the destruction brought by the First World War and the civil war which followed the 1917 Russian Revolution. He worked with French international lawyers to draft a treaty by which museums, churches and buildings of value would be preserved in time of war through the use of a symbol − three red circles representing past, present and future – a practice inspired by the red cross to protect medical personnel in times of conflict. The Roerich Peace Pact is the world-law basis for an expression of concern from the governments of what was the Pan-American Union (In 1948 it was reestablished as the Organization of American States). There is also the Hague Convention of May 1954 which was signed by a wider geographic range of States. The Roerich Peace Pact and the Hague Convention are rarely cited by governments. Therefore, leadership must come from non-governmental organizations and the cultural sector to work unitedly and creatively to prevent the wanton destruction of humanity’s cultural heritage.